A statue of a couple uniquely located on a bench along Avenue McGill College in the downtown area of Montreal, Quebec, Canada. Around the downtown core of Montreal, Quebec you will find statues displayed at different locations around the city and this particular one is on Avenue McGill College. Many tourists stop at this bench and get their picture taking with this statue of a couple sitting in front of the flower garden. Statue of a couple on a bench along Ave McGill College in downtown city of Montreal, Quebec, Canada. 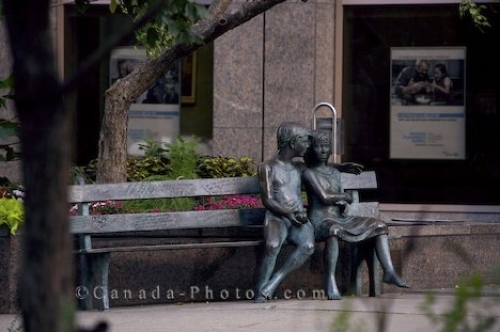 Picture of a bronze statue of a couple along Avenue McGill College in downtown Montreal in Quebec, Canada.